Scrubbers, Enclosed Flares, and Oxidizers treat and remove chemicals and gas from processing streams. Manufacturing and processing chemicals generate exhaust streams laden with potentially harmful chemical and gas residue.Chemical Scrubbers, Enclosed Thermal Flares and Thermal Oxidizers are used to treat the residue from the exhaust. Pollution Systems has a full line of scrubbers and oxidizers designed to collect and abate the targeted emission in the process stream. Chemical/Gas Scrubbers are effective for treating and removing chemical residue in exhaust vapors. The scrubbers inject cleaning liquids into the scrubber and countercurrently pass the exhaust vapor through the scrubber. Required contact time between the vapor and cleaning fluid is based on the chemical, its concentration in the vapor and the required removal efficiency. Typically, acidic solutions are used to interact with basic contaminants and basic solutions are used to interact with acidic contaminants. Salts are produced and stay with the liquid stream. Contact time is managed to provide sufficient time for the chemicals to react with the cleaning liquid and to drop out of the vapor. With destruction rates over 99%, these scrubbers produce clean exhaust for release into the atmosphere. Recuperative Oxidizers are effective for treating chemical residue that contains Volatile Organic Compounds (VOCs) and particulate in the exhaust stream. The oxidation process uses combustion to destroy the pollutants and can achieve destruction rates over 99%. Energy from the exhaust of the oxidizer chamber is used to preheat the incoming process gas. High-VOC Thermal Oxidizers are used to clean emission streams that have high energy content. These oxidizers are able to use the process discharge stream as fuel and significantly reduce the amount of energy required to operate the equipment. Regenerative Thermal Oxidizers are effective for treating chemical residue that contains lower concentrations of VOCs and higher flow rates. Ceramic media is used to capture and store heat from combustion and subsequently release the heat to pre-heat the incoming process exhaust. 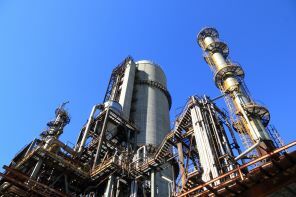 Catalytic Thermal Oxidizers are effective for treating chemical residue that contains lower concentrations of VOCs and is free from particulate and poisons. By incorporating catalyst in the system, the treatment process occurs at a significantly lower temperature, reducing energy consumption. Pollution Systems’ custom designs can provide you with the Chemical Scrubber, Recuperative Thermal Oxidizer, High-VOC Oxidizer, Regenerative Thermal Oxidizer, or Catalytic Oxidizer to meet the specifications of your Chemical Processing application. Our expert staff has the skill and experience to design and manufacture an efficient, reliable, cost-effective solution for your Chemical Processing operation. Buying equipment from Pollution Systems is only the beginning, not the end. We design and build the systems and provide service support throughout the life of the equipment. We also offer short, medium and long-term Rentals of our Thermal Oxidizers for industrial processing during the installation of new equipment, for extra waste processing during remediation, or for running pilot studies prior to purchase.